Hey all! Greenrift Software’s first Android application has just been released to the Marketplace (tap on the icon called “Market” on your Android phones, or click here). 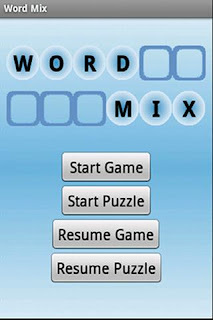 Word Mix is based on the likes of the famous Text Twist game. You are presented with 6 letters and you need to guess the 6 letter word before time runs out to continue. Guess as many other words as you can to rack up points. Word Mix has an added feature that will give you a hint once every five rounds. So, use it sparingly. You can compete against the clock or take a more leisurely approach and play an untimed game. In the untimed game, in order to move on to the next level you must correctly guess ALL of the words possible. This could pose more of a challenge for some players. Unsure about whether or not one of the words in the game is an actual word? At the end of each level, you may tap on any word to look up the definition thanks to Dictionary.com. Word Mix is $0.99. There is also a free version that is ad supported called Word Mix Lite.